A new report targets the likes of Yahoo!, Google, Microsoft, Skype, and Cisco for their role in aiding China's "Great Firewall." In the pursuit of profits, principles often become collateral damage. This is the dilemma U.S.-based internet companies operating in China struggle with. Economic opportunism, unchecked by moral and ethical concerns, incurs more than just bad publicity – it costs lives and personal freedom. Western internet companies in China are navigating a precarious grey zone between collusion and collision, where compliance with domestic laws is often used to justify collaboration in China’s official censorship regime. It is a reality that businesses must obey the rules and regulations of the country in which they operate. But at what point does industry have to take it upon itself to choose ethics over growth, and socio-political responsibilities over economic prosperity? China’s online monitoring and surveillance system is pervasive: It is a vast network of overlapping regulations and legislation coupled with a technically sophisticated filtering regime. It is officially known as the Golden Shield, but more aptly referred to as the “Great Firewall.” Behind it are almost half a billion internet users. It is a lucrative environment for western technology companies, and the lure of profits can tempt even the most ethical corporations. Our report examines the actions of Yahoo!, Google, Microsoft, Skype, and Cisco. These companies demonstrated varying levels of complicity, but all of them acquiesced to Chinese online content restrictions or contributed to the climate of censorship. Internet activists accuse governments, including Egypt and Pakistan, of trying to control the Internet though filtering, content blocking and user surveillance, and want a charter put in place that protects consumers from these tactics. De Boer-Buquicchio wants representatives of member governments, ICT industry members and civilians to take part in the formation of the charter, alongside the Council of Europe, which comprises of 47 states. Nassau, Bahamas - Public Servants were challenged to “embrace e-Government” wholeheartedly as the process will allow the Public Service to become more client-centred and productive. Minister of National Security, the Hon. O.A. “Tommy” Turnquest said the Government of The Bahamas’ commitment to e-Government will transform the Public Service into an even more efficient entity by providing the general public with greater access to public information and government services. He further said the provision of on-line services in areas such as the payment of real property taxes, renewal of driver’s licenses and submission of applications for passports, marriage licenses and death certificates, in addition to the payment of traffic fines, will assist public servants in meeting the needs of citizens, residents, businesses and non-residents, in a more efficient manner. Mr. Turnquest was addressing a Service of Thanksgiving, which was one of the many activities organised to celebrate the 12th Annual Public Service & Recognition of Retirees Week (September 24-Oct. 1). Others include a Retirees Appreciation Ceremony scheduled for September 27 at Government House, Mount FitzWilliam; a Gospel Concert (Thursday, September 29 at Holy Trinity Centre, Stapledon Gardens) and the National Public Service Officer of the Year Awards Ceremony (scheduled for Friday, September 30 at Government House, Mount FitzWilliam). Mr. Turnquest said that, over the years, civil servants have been subjected to “negative and harsh commentary and public opinions” for the poor delivery of services to the Bahamian public. “Our goal (through e-Government) is to get the negative perception of the Public Service to nil,” Mr. Turnquest said. “Without the dedicated work and efforts of thousands of public servants over the decades, The Bahamas would never have attained the level of success and progress that defines our country today. “(But) even as we celebrate the successes of the Public Service, we must all acknowledge that there is room for improvement in such a crucial sector,” Mr. Turnquest added. “I urge all public servants to constantly strive towards higher levels of courtesy, empathy and urgency when dealing with the public and to deal with them equally,” Mr. Turnquest said. “The Public Service must be more than a job. It must entail doing your work efficiently, honestly and with complete dedication to the people and the nation with full recognition that every single person who interacts with you is entitled to courtesy and consideration,” Mr. Turnquest added. The European Commission (EC) is to undertake its largest ever study into broadband speeds across the region to gain an insight into the work needed to reach its ambitious Digital Agenda targets. The EC has set a goal of providing all citizens with 100Mbit/s connections by 2020, and is hoping to persuade 10,000 volunteers across 30 nations to send data on their broadband speeds. The project will be run by UK firm SamKnows, which has already conducted similar studies with Ofcom in the UK and the Federal Communications Commission in the US. Volunteers will be sent a small 'SamKnows Whitebox' to plug into their internet connection which automatically measures broadband speed and performance. The first readings will be sent back to SamKnows within the coming weeks as the devices are rolled out, and SamKnows chief executive Alex Salter said that the EC is likely to produce the first results in the new year. The project is being run across all 27 member states plus Croatia, Iceland and Norway. Citizens wanting to take part can register at http://www.samknows.eu/. 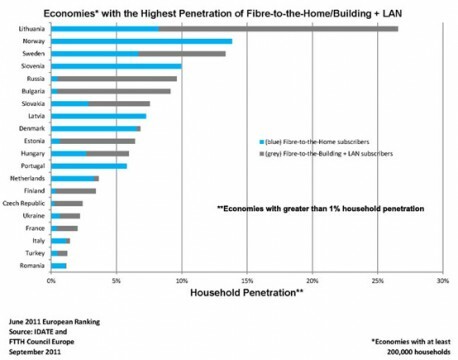 Europe, excluding Russia, ended the second quarter with 5 million FTTH/B subscribers out of 28 million homes passed, according to an announcement at the Broadband World Forum in Paris. However, Russia alone added 964,000 new FTTH/B subscribers during the first half of the year, bringing the total in the country to 5.15 million. Taken together, Europe and Russia had 10.2 million FTTH/B subscribers and 39.8 million homes passed at the end of Q2, or 22% more than a year earlier. Lithuania led the European ranking with 26.6% of households subscribing to services, followed by Norway, Sweden, Slovenia, Russia, Slovakia, Latvia, Bulgaria, Estonia and Denmark, with each of the to top 10 markets having a penetration rate of at least 6%. Hungary was a new entrant at number 11, with 235,055 FTTH/B subscribers and a 6% subscriber penetration rate, though the market, dominated by Magyar Telekom, was very fragmented, with many players only active in local areas. The market in Ukraine, ranked 16th with 450,000 FTTH/B subscribers and a 2.2% subscriber penetration rate, was meanwhile dominated by Vimpelcom.